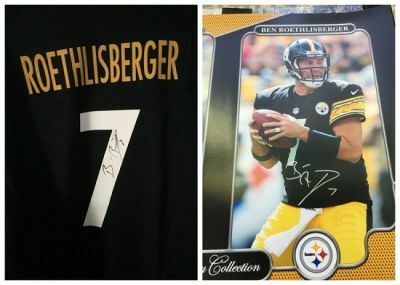 Big Ben 7 - Last additions/June 3, 2018 - "Thank you Ben!" June 3, 2018 - "Thank you Ben!" “My friend Jim and I were at the UPMC Lemieux Sports Complex for the Pens practice in May. We were standing in the parking lot talking and a gentleman approached us and stated that Ben was here, working out in the upstairs gym. We went inside and checked it out. Jim and I were both lucky to have something on us at the time for Ben to sign if we found him. Ben walked out towards the exit and he was on the phone, I approached him and asked if he would mind signing my jersey and my friends photo. He signed both items for us! He could have kept on walking but he was nice enough to stop. We were both in complete disbelief that we actually got the chance to see Ben, let alone have him sign an autograph!! Ben, I just wanted to personally thank you for stopping and signing my jersey and my friends photo yesterday. We both appreciate it, wishing you the best this season and into the future!” — Mike Slagle. *Mike, thank YOU for sharing your story & photos with us!